This letter, from a George Williams to A.J. 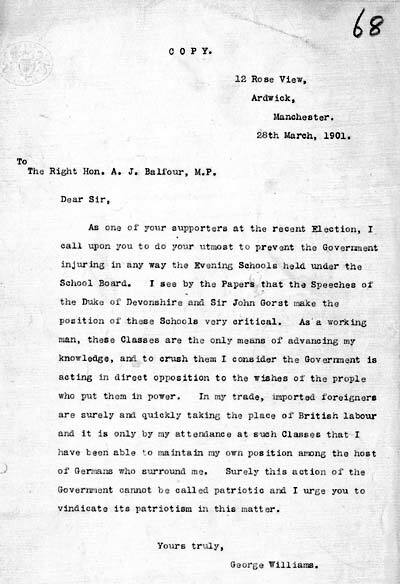 Balfour, the Minister for Education, demonstrates the importance of adult education at a time when few had access to secondary schools and also shows British fears about competition from foreigners and immigrants. Robert Morant, in a minute contained in the same government file as Williams' letter, commented that, while such letters might be part of an orchestrated political campaign, they nevertheless showed 'the political danger of the situation. These adult scholars at Evening Schools have votes'. Leading Tories, such as the Duke of Devonshire, who was President of the Board of Education, also argued that 'unless secondary schools can receive some assistance, either from the taxes or the rates, I am afraid that we shall remain permanently behind other countries'.